Will you be bounding along Boscombe beach my deer? 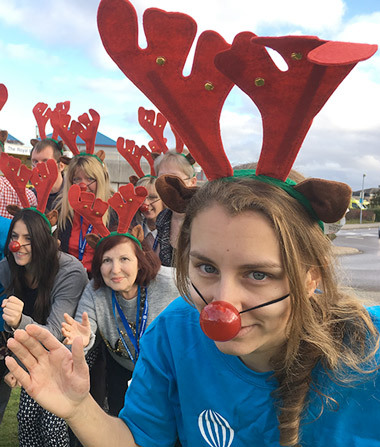 A herd of reindeer-themed runners are set to bound along Boscombe beach this December for a festive, family-friendly fun run to raise funds for Bournemouth Hospital Charity. Hot on the hoofs of a successful first event in 2016, the Reindeer Run returns on Saturday 9 December at 5pm to provide Christmas cheer and help raise money for Bournemouth Hospital Charity. This festive 5K is for all ages and participants will be wearing reindeer antlers and red flashing noses as they run, walk, jog or canter along the seafront from Boscombe Pier. A DJ will help get the reindeer rocking to classic Christmas tunes and fancy dress, while optional, is encouraged. Registration is £10 for adults and £5 per child (under 16s) and anyone wanting to join the herd can sign up now at BHCharity.org/reindeer-run/. Participants are encouraged to raise sponsorship. Funds raised will support Bournemouth Hospital Charity’s efforts to provide new equipment, improvements and training at the Royal Bournemouth and Christchurch Hospitals. This year’s Reindeer Run is supported by Williams Thompson Solicitors in Christchurch.